Google optimization for both organic search (SEO) and paid search (SEM) has been a standard element in online marketing for quite some time. Optimization on Amazon, however, still seems to be in its infancy: so far, only a tiny fraction of sellers on Amazon have started to seize all the opportunities to increase sales on the world’s largest e-commerce platform by means of active optimization. This is somewhat surprising given the fact that more and more consumers, when searching for products online, in fact skip searching on Google and directly turn to Amazon to search for products (Source: Forrester, 2012). This way, Amazon is becoming the primary sales channel for an increasing amount of online retailers – ahead of Google. This points to a substantial discrepancy between Amazon’s high share of overall online retail sales and the low attention that Amazon optimization is currently still getting, as reflected in the marketing mix of most online retailers. This discrepancy is in part caused by a lack of knowledge about the topic and a lack of a properly developed “eco system” that includes agencies, tools, conferences, etc. We intend to gradually fill some of these gaps and in this post, the aim is to present and discuss several key similarities and differences between optimization on Google and on Amazon. While the focus is a different one in each case, both Google and Amazon are essentially search engines. And in both cases, the main objective is to rank high for relevant keywords! Both search engines display both organic and paid search results. Google by default shows 10 organic and various paid results per page, Amazon lists 16 organic and 2 paid results (14 organic results in the mobile app). There is room for optimization on both search platforms. Even after years of experimentation, the workings and calibration of Google’s ranking algorithm are not fully known (and change over time). The same goes for Amazon’s algorithm, plus there have hardly been any experiments and tests carried out so far. For merchants, this means that knowledge has to be created by trial and error, but it also implies that profound insights that anyone in the marketplace gains can lead to long-term competitive advantages! SEO for Google has been common practice for years. For Amazon, too, there are opportunities for systematic optimization, which we found out by running our own test scenarios. Like on Google, rankings on Amazon are subject to constant changes because of competitors and changing user preferences. This is why optimization has to be long-term oriented and reviewed permanently. After all, the top ranks are not reserved for anyone! As mentioned before, Google and Amazon are both search engines, but they have a different focus: Google is a universal search engine, and Amazon is a specialized product search engine. This distinction is important as these different types of search engines represent different stages in the buying process. 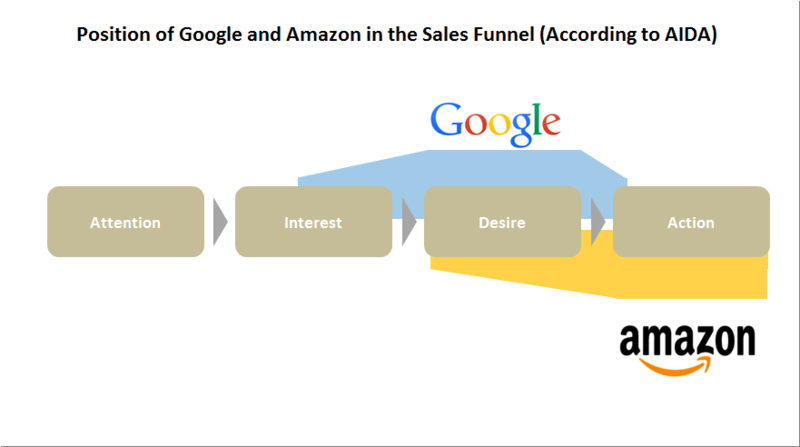 While a search on Google represents a middle stage of the sales funnel (see illustration), Amazon searches reflect the final stages and the lower end of the funnel.Increasingly even the whole buying process, from product research to buying and reviewing is carried out on Amazon (end-to-end marketplace). This difference has important implications: Google can’t always know which goals users are pursuing with a search and whether they achieved their goals on a website they were directed to. A user searching for “iPhone 6” on Google may want to buy one but maybe they are just looking for some reviews. If the user clicks on a link, Google cannot be completely sure if they found what they were looking for. This is because Google cannot know exactly which metrics to track in each case and cannot track everything for technical reasons. That’s why Google uses a number of indicators for the ranking of results in order to approximate the relevance (e.g. CTR of ads and organic listings, page loading time, structure and content of the landing page, time spent on page, external links, etc.). So the most important measure that Google tracks is CTR. For Amazon, this is different. Amazon always knows the goal of a user (buying), and also knows whether users reached this goal. Rather than just considering the CTR of a listing for a certain keyword, Amazon also knows the conversion rate and sales volume as well as numerous user-related indicators (CLV, shopping cart etc.). Since the goal on Amazon is always clear (buying) and the achievement of the goal can be tracked well, conversion rate and CTR are of central importance.Because of these differences optimization for Google and Amazon has to focus on different target indicators. While for Google it is CTR and several relevance factors that matter, conversion rate and CTR are the most crucial for Amazon. Try it yourself: If you think that user behavior is the same on Google and Amazon when searching, check the differences in Amazon vs. Google keyword search volume with Sonar, a free Amazon keyword research tool from Sellics. There are also clear differences regarding the adjustments that can be made to improve the target indicators. The known SEO distinction between on-page and off-page will be discussed here. There are virtually no limitations in designing your own webpage and optimizing it for Google search. The content, its length and formatting is up to individual choice. Other than human capacity constraints, there isn’t really a limitation to creating ever more content and landing pages. On Amazon though, there is a pre-defined number of fields, with a maximum number of characters, or even prescribed options you have to choose from. On-page optimization is therefore regulated by the framework provided by Amazon and not as limitless as for Google search. But still, optimization on Amazon should not be considered a one-time adjustment, but should be monitored and improved continuously in terms of product titles, descriptions, etc. With off-page optimization, we can see a great difference in the ‘directness’ of the influence: While the number and quality of external links are part of the ranking algorithm for Google and thus directly influence the ranking, they are not taken into account in Amazon’s ranking algorithm. Does this mean there is no off-page optimization at all for Amazon? Well there is, but it works rather indirectly. Say you are able to enhance your brand awareness, then there will also be more searches on Amazon that include the brand name. For this type of search query, the branded products will be clicked and bought more often, so CTR, conversion rate and sales rank are positively influenced. This in turn will also drive your rankings for other (not brand related) keywords. The same goes for external links: Links to you products may generate additional sales which in turn may improve CTR, conversion rates and sales ranks. This is why the influence of off-page optimization for Amazon is indirect: Links per se don’t lead to improved rankings, but the extra sales will. Over the years, a whole industry has emerged around Google optimization. In contrast, the few Amazon optimizers that exist to date still find themselves on a greenfield with few data, tools or relevant communities available. Without any tools for tracking and adjusting the different factors, it’s hardly possible to optimize for sales success on Amazon. With our analysis tool we decided to provide the necessary foundation for measuring all these key figures and for understanding the effects of your optimization efforts. The greenfield image also applies to agencies, communities, and third-party suppliers: again, compared with Google there are only very few touch points for exchanging knowledge and experiences. It’s become clear that the current context conditions for Amazon optimization are a lot worse than for Google. In fact, this can be an opportunity. The optimization potential for third-party sellers on Amazon is anything but well exploited so far. Since most sellers aren’t optimizing at all thus far, you may easily leapfrog competition if you start with Amazon optimization even just a little bit. Generally, the returns for the first sellers to optimize are very promising. Also, for now there is not a huge body of knowledge to catch up on. This way it’s still fairly easy to become an expert and secure your spot among the top Amazon optimizers in the long run. Amazon optimization is still in a very early stage. By gradually contributing to the knowledge base around this exciting topic, we hope to give sellers a better understanding of what optimization for Amazon is all about and help maximize your potential selling on Amazon!